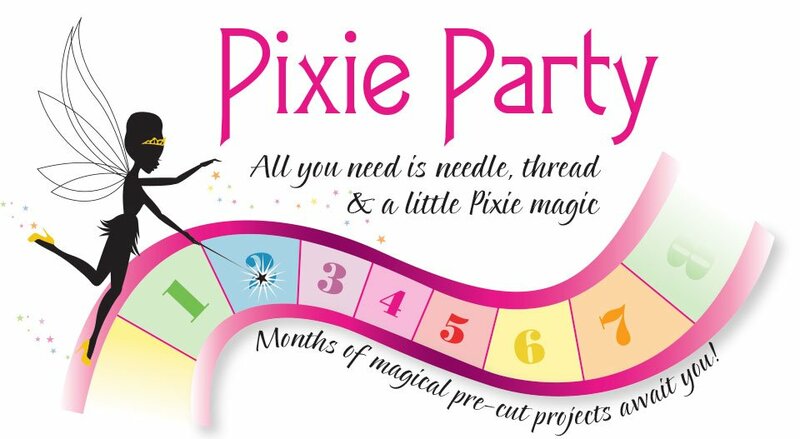 Pixie Party is the ultimate monthly program that features 2 1/2" strips from RJR. There is no other program like this! All the fabric elements from strips to borders and binding are pre-cut. Geared toward confident beginners, the projects are offered in a variety of sizes and feature RJR's newest designer collections. After months of planning it is now time to reveal the fourth quilt in our Pixie Party series, Intertwined. Using fabrics from RJR's Serene Garden, Intertwined portrays a stunning Japanese Tea Garden. With 2 1/2" strips, you can complete this striking quilt in no time at all. The magic is in the setting. By twisting and turning one simple block, you can create a balanced interlaced effect. The blocks come together to create a secondary pinwheel design, giving the quilt added depth and dimension. Use the Strip Tube Ruler by Cozy Quilt Designs for quick triangles. The piecing is easy, and with accurately pre-cut strips, as well as border and binding strips pre-cut to the width and length of the quilt, this project is perfect for confident beginners and advanced quilters alike. Intertwined finishes at 64 by 74 inches, making it a perfect throw size. After months of planning it is now time to reveal the third quilt in our Pixie Party series, Braidwork. With fabrics from RJR's Cotton Supreme Solids, Braidwork transforms simple 2 1/2 inch strips into stunning dimensional braided columns. The play of the black against the saturated hues creates a vibrant and distinctive look. The solids provide wonderful negative space to highlight quilting designs. The Braidwork Kit comes with the sashing, background squares, triangles, borders and strips all pre-cut. The border strips are even cut length of fabric. The piecing is easy, and with accurately pre-cut strips, the quilt is perfect for confident beginners and advanced quilters alike. The quilt finishes at 68 by 82 inches. After months of planning it is now time to reveal the second quilt in our Pixie Party series, Glory. With fabrics from RJR's Heart & Home collection, and Jinny Beyer Palette, Glory captures the beauty of two-color patriotic quilts. Glory is created from one simple repeating block assembled with the easy stitch and flip technique. The magic is the setting and the twisting and turning of that block! It is constructed of nine-patch blocks, triangles and background squares. The Glory kit comes with all the triangles, background squares and sashing segments pre-cut. The border strips are even cut length of fabric. The piecing is easy, and with accurately pre-cut strips, the quilt is perfect for confident beginners and advanced quilters alike. The quilt finishes at 99 by 113 inches, making it a perfect king bed size. After months of planning it is now time to reveal the first quilt in our Pixie Party series, Cotton Rainbow. With fabrics from Jinny Beyer's debut batik line, Malam Batiks, Cotton Rainbow captures the brilliance of a rainbow in the sky. By playing with just one simple block and arranging fabric, you can create magical results. The piecing is easy, and with accurately pre-cut strips (print, background, and borders), the quilt is perfect for confident beginners and advanced quilters alike. The quilt finishes at 64" square.